Introduce your group to Ratatouille the pumpkin, and Boo Boo the ghost. 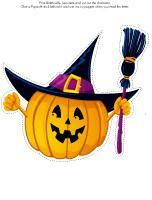 They have prepared many Halloween crafts, and activities for your group. (Open thematic poster-Halloween-Thematic letters) Print, laminate, and decorate the walls of your daycare with all kinds of posters. For this theme, the educatall team has prepared three thematic letters related to Halloween. Each thematic letter represents a week's worth of activities. Choose among the three themes. We suggest you print the letters and deposit them in a special Halloween envelope, box, or container each morning. A large coffee pot wrapped with black and orange construction paper and decorated with plastic spiders. A large black pot with cotton balls glued around the edge to represent steam. Drop plastic spider webs or insects inside. A large envelope covered with black and orange hand prints, spiders, black cats, or pumpkins. A cardboard box decorated by your group with Halloween-themed stickers. A plastic pumpkin with Halloween decorations deposited around it. 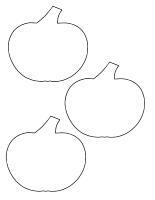 (Open thematic letter-Pumpkins) Print the letter and set the stage for this imaginary game. Encourage children to find the letter and read portions of it to them each day. Laminate the character and glue a Popsicle stick behind it. Use it as a puppet when you read the letter. Pumpkin garland (Open models-colored pumpkins) Print and let children decorate the pumpkins. Cut them out and hang them to form a garland within your daycare or near your daycare entrance. Pumpkin mobile (Open model pumpkin) Trace and cut out pumpkins of different sizes. Decorate them with glitter, lace, ribbon, cotton balls, etc. Glue them back to back on either side of string or ribbon and hang your mobile from the ceiling. Pumpkin path (Open colourful pumpkins) Print several pumpkins and use them to create a path leading to different areas children visit throughout the day (cloakroom, bathroom, table, etc.). Make a pumpkin-shaped piñata with your group. Fill it with candy or Halloween treats. Hang it from the ceiling and empty it during your Halloween party. Hello, My name is Ratatouille and I am... you guessed it, a big, fat pumpkin. Did you know that cucumbers are my cousins? Squash and watermelons are my cousins too! We are all part of the great cucurbitaceous family. This week, I am visiting you because Halloween is, in a way, my birthday. I can be seen everywhere and I am the star! I want to be the star of your daycare too. I have so many suggestions for you and your group. Your early childhood educator will explain everything as the week progresses. For the early childhood educator: You will find many craft and decoration ideas in the educatall club. We have listed a few here, but you may choose the ones you feel your group will enjoy the most. (Open Mrs. Pumpkin) Print for each child. Have children cut out the different parts and color them. They can use fasteners where indicated to assemble their pumpkin character. Trace a pumpkin model on a piece of cardboard. Deposit dry pasta pieces and green food coloring in a Ziploc bag and shake to coat the pasta pieces. In another bag, do the same thing using another type of pasta and orange food coloring. Let the pasta pieces dry. Children must use the green pasta pieces to fill the stem of the pumpkin and the orange ones to fill the pumpkin. Cut a pumpkin shape out of adhesive paper. Let children glue pieces of tissue paper on the shape. Good morning, Today, I want to get you moving. With your early childhood educator, you will be given the chance to discover several games which involve jumping, running, and walking. Have fun! For the early childhood educator: Here, you will find a few suggestions of activities which involve gross motor skills. Have fun being active with your group! Divide your group into two teams. Have each group stand on a line so that the teams are facing each other. In the centre, between the two lines, deposit a small pumpkin. Give each player a name (spider, bat, witch, pumpkin, etc.). Each name must be given to two players, one from each team. For example, if there is a witch in one team, there must be a witch in the second team also. When you are ready, call out a name. The two children who were given this name must run to try and grab the pumpkin, and then run back to their team. Each time a child successfully brings the pumpkin back to his team, the team scores a point. Keep score and continue playing until each child has been given at least one chance to try and steal the pumpkin for his team. Have children sit in a circle. Have them pass a small pumpkin around the circle, but without using their hands. They can use their neck, their elbows, their knees, etc. If a child drops the pumpkin, he must sit in the centre of the circle. Keep going until there is only one child left and then start all over again! 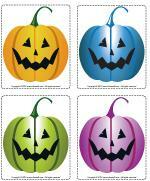 (Open colourful pumpkins) Print, laminate, and cut out the pumpkins. Deposit them on the floor throughout the yard (or inside your daycare) to create a path. To the sound of music, children must walk from one pumpkin to the next. When you stop the music, name a color. The child (or the children) standing on this color can pick a Halloween treat out of a box. Continue the game until each child has a treat. Use tiny plastic pumpkins (or construction paper pumpkins). Hide them throughout the yard (or your daycare). When you give the signal, children must collect the pumpkins. Ask children to bring you the pumpkins one at a time as they find them. This will give younger children a chance to find pumpkins too! 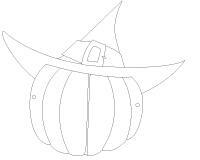 You will find several printable pumpkin games and activities in our Halloween themes. Choose the ones you think the children in your group will enjoy most and set up workshops as if you were at school. You may also use our Halloween activity book or Halloween coloring pages. P.S. Tomorrow, you must wear your Halloween costume! For the early childhood educator: For this workshop, we suggest you bring at least two large pumpkins to ensure each child gets to manipulate the pumpkin seeds and the pumpkin contents. To roast the pumpkin seeds, simply clean them and spread them out in a single layer on a baking sheet. Drizzle with oil and sprinkle with a small quantity of salt. Roast in a 400 °F oven, keeping an eye on them. For the early childhood educator: Invite children to wear their Halloween costume to the daycare for this special day. Decorate the daycare to make it look like a haunted house. Close all the curtains and blinds and use as little light as possible to create a spooky atmosphere. At lunch time, invent strange Halloween-related names for the foods you serve (toad tongues, mice feet, etc.). Add a drop of green or orange food coloring to children's milk for a special touch. Sing and dance with your group. 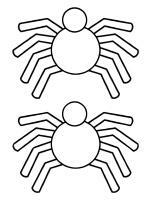 (Open thematic letter-Spiders) Print the letter and set the stage for this imaginary game. Encourage children to find the letter and read portions of it to them each day. Laminate the character and glue a Popsicle stick behind it. Use it as a puppet when you read the letter. Spider garland (Open models-colored spiders) Print and let children decorate the spiders. Cut them out and hang them to form a garland within your daycare or near your daycare entrance. Spider mobile (Open model spider) Trace and cut out spiders of different sizes. Decorate them with glitter, lace, ribbon, cotton balls, etc. Glue them back to back on either side of string or ribbon and hang your mobile from the ceiling. Spider web. Create your own spider web using string or white ribbon. Begin by attaching the extremities of the string or ribbon to the ceiling and then weave the string, attaching different sections to the ceiling until you have a spider web shape. Spiders. Twist four pipe cleaners together in the centre to create eight spider legs. Add a piece of elastic string to the middle of the spider's body. Make many spiders and hang them from the ceiling. Children will like to pull on the spiders and watch them dance. Hello my friends, First of all, let me introduce myself. My name is Sticky Web. You don't know me yet, but I am sure you have guessed that I am a spider. I am not an insect, but I am often mistaken for one. Insects have six legs and I have eight legs. My legs make weaving beautiful webs possible. I love Halloween because I get to see my spider friends everywhere. Can you believe many people are afraid of me? I don't understand why. I am not mean or dangerous at all. This week, I will visit you each day. I will come prepared with many activities which will help you learn more about spiders. Hi! Today I want to give you the chance to learn a few spider facts. I know that many children are afraid of spiders but we are not dangerous, I promise. I am actually quite nice. After all, little bugs can't eat big bugs right? I provided your early childhood educator with several spider craft ideas. I hope to see spiders everywhere when I return. Have fun! For the early childhood educator: You will find many craft and decoration ideas in the educatall club. We have listed a few here, but you can pick and choose the activities you think the children in your group will enjoy most. Have children paint a Styrofoam ball with black paint. Insert eight black pipe cleaners to represent the legs. Let them glue wiggly eyes on their spider or, if you prefer, they can use white paint to add eyes. You will need paper plates, black paint, wiggly eyes, and pipe cleaners. Let children paint their plate black and let them glue two wiggly eyes on it. They can paint or draw a nose and a mouth on their spider. Finally, they can glue pipe cleaners on either side of the plate to represent their spider's legs. Hang the spiders from the ceiling. (Open model-Spider) Print. Trace the model on black paper. Have children cut out the spider shape. Let them decorate their spider. Offer to help them curl the paper legs by wrapping them around a pencil. For the early childhood educator: We have chosen a few physical activities. Have fun being active with your group! (Open model-Spider) Print and cut out enough spiders to ensure you have at least ten per child. Deposit all the spiders in the centre of a parachute or a blanket. Children firmly hold on to the edges of the parachute. When you give them the signal, they raise the parachute to send the spiders flying. As the spiders fall to the ground, children must try to pick up as many as possible. If you wish, count how many spiders each child collected. Give each child a ball of yarn. Attach the end of each ball of yarn in a different corner of the daycare (tie them to chairs, tables, etc.). Children become little spiders and weave a giant spider web by moving in every direction with their ball of yarn. (Open Twister-Halloween) Print and glue the large illustrations on the floor using adhesive paper to create a 4 ft x 4 ft playing area. The leader of the game picks a Halloween card and a body part card and calls out instructions as in the traditional Twister game (put one foot on a black cat, put one hand on a witch hat, etc.). Variation for younger children: Use the illustrations to decorate your daycare or for a simple recognition game (example: ask them to identify the bat). You can glue the illustrations on the floor using adhesive paper. Children will love to admire them. For the early childhood educator: You will find several printable games and activities in the educatall club's Halloween theme. Choose the ones you feel your group will enjoy the most and organize workshops like the ones presented in schools. You may also use our Halloween activity book or Halloween coloring pages. For the early childhood educator: Organize several little activities which can be presented in the dark. These activities may help certain children tame their fear of the dark. Close the curtains and lights to make your daycare as dark as possible. Give each child a flashlight and encourage your group to observe the objects found in your daycare. Hide several plastic spiders throughout the daycare. If you have some, use fluorescent spiders and let children search for them in the dark. For the early childhood educator: Today's instructions are simple: spiders everywhere! Greet children by drawing a spider on their cheek. Hide plastic spiders throughout the daycare and drop some in children's coat pockets while they are napping. Set a paper tablecloth on the table at lunch time and invite children to draw spiders on it. For snack time, prepare spider cupcakes with your group. Simply spread coloured icing on cupcakes and add colourful liquorice to represent the legs and candy pieces for the eyes. (Open thematic letter-Ghosts) Print the letter and set the stage for this imaginary game. Encourage children to find the letter and read portions of it to them each day. Laminate the character and glue a Popsicle stick behind it. Use it as a puppet when you read the letter. Ghost garland (Open model-ghost) Print and let children decorate the ghosts. Cut them out and hang them to form a garland within your daycare or near your daycare entrance. Ghost mobile (Open model-ghost) Trace and cut out ghosts of different sizes. Decorate them with glitter, lace, ribbon, cotton balls, etc. Glue them back to back on either side of string or ribbon and hang your mobile from the ceiling. Silly ghosts. Create silly ghosts by filling white rubber gloves (doctor gloves) with air and drawing faces on them. If you prefer, use Styrofoam balls and drape tissues over them. For the early childhood educator: You will find several decoration and craft ideas in the educatall club. We have selected a few for you, but feel free to choose the ones you feel your group will enjoy the most. Follow your intuition. Have children press their hands in white paint and then make hand prints and footprints on black construction paper. Turn the construction paper 180 ° to see tiny ghosts appear. Cut ghost shapes out of adhesive paper. 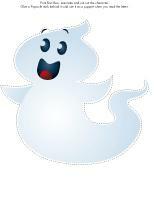 Have children fill the ghost shapes with cotton balls or white tissue paper. 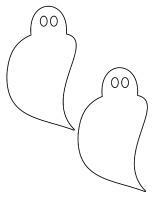 Trace the outline of a ghost on white construction paper. Fill the shape with cotton balls, crumpled pieces of white tissue paper, dry pasta pieces which have been painted white, etc. Add eyes and use the ghosts to decorate your daycare. (Open miniature ghost) Print, cut out, and color the pieces. Have children glue them on an empty toilet paper roll to create a miniature ghost. Hang the ghosts from the ceiling or display them on a shelf. For the early childhood educator: We have selected a few activities which are sure to get your group moving... and you too! Invite children to move about the daycare to the sound of music. When the music stops, children must lie down on the floor, roll up in a ball and close their eyes. Once all the children have their eyes closed, drape a white blanket over a child. When you are ready, have children open their eyes and guess which child is the "ghost". Make a piñata out of a white plastic garbage bag. Fill it with leaves and hang it in a tree. Let children hit it with a stick until it pops open and the leaves fall out. (Open model-ghost) Print and cut out enough ghosts so that you have at least five per child. Deposit them on a parachute or blanket. Children firmly hold on to the edges of the parachute. When you give them the signal, they raise the parachute to send the ghosts flying. As the ghosts fall to the ground, children must try to pick up as many as possible. If you wish, count how many ghosts each child collected. (Open model-ghost) Print, laminate, and cut out several ghosts. Arrange the ghosts on the floor or in your yard to create a path. To the sound of music, children walk around wearing a white bed sheet or piece of tulle over their head. When the music stops, children must rush to stand on a ghost. You can, for example, ask children to stand on one foot or sit on the ghosts to make the game more challenging. Hello my little ghosts, Welcome to ghost school! Today, writing, association, and maze activities await you. Some of the activities may be difficult, but the only rule is to have fun! You will also be given the chance to draw. 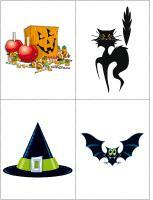 For the early childhood educator: You will find several printable activities in the educatall club's Halloween theme. Choose the ones you feel are best for the children in your group. Organize various workshops like the ones presented in schools. You may also use our Halloween activity book or Halloween coloring pages. Hello again! Mmm... This is my favorite day of the week. We are going to prepare sweet treats! With your early childhood educator, you will prepare treats using marshmallows. Marshmallows are one of my favorite ingredients. Have you ever noticed how marshmallows look a lot like ghosts? Follow your early childhood educator's instructions closely and when you are done ... enjoy! Boo Boo, the ghost baker P.S. Tomorrow, you must wear something white! For the early childhood educator: Prepare Rice Krispies squares with your group and help them notice how marshmallows look a lot like ghosts. You can also let children make ghosts out of miniature and regular-sized marshmallows. They can decorate these ghosts with candy pieces and use liquorice to represent the arms and legs.